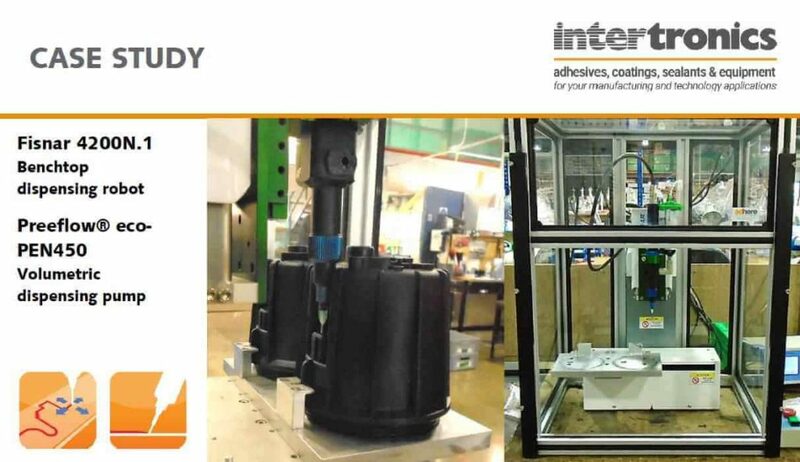 The Relyon Plasmatool is a portable, handheld surface treatment device for improving adhesion and wetting on difficult to bond plastics like polyethylene, polypropylene and other polyolefins. 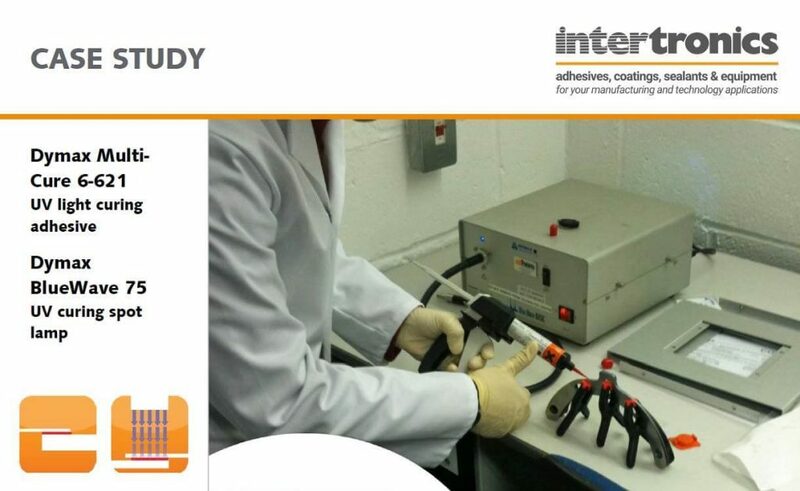 The Plasmatool is particularly effective where materials cannot be treated automatically because of size or mobility. 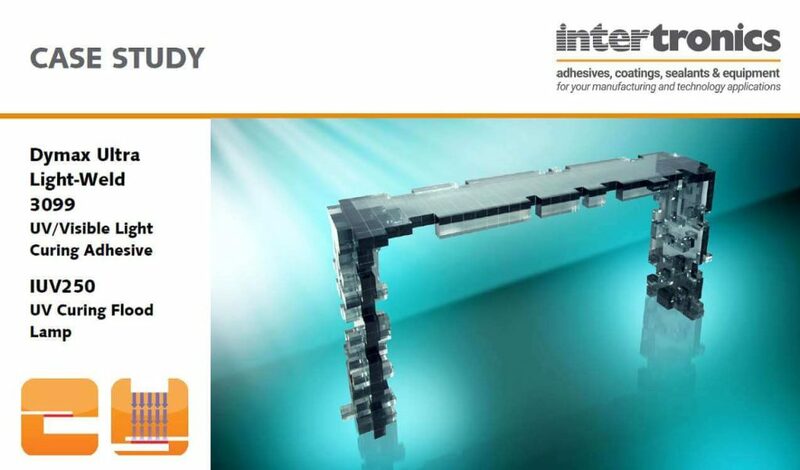 Choosing, buying and using adhesives, coatings and sealants represents a critical process for which you rightly expect the most responsive and knowledgeable support. 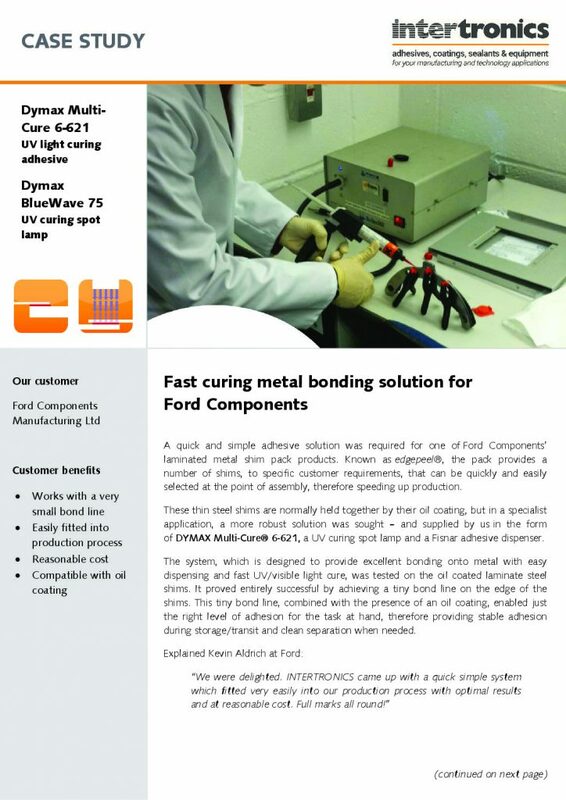 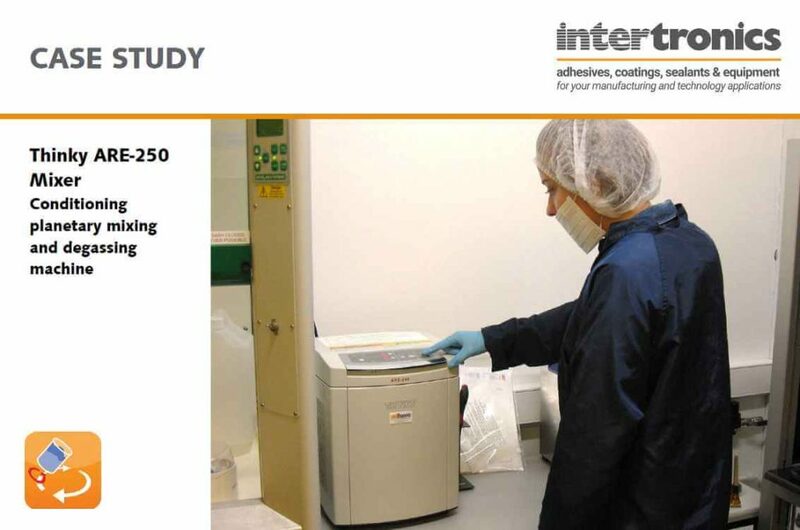 The fact that we focus on supplying these materials – together with the associated dispensing, mixing, surface preparation and curing equipment and our highly proficient technical and applications advice – means that we closely support you not only in the selection, evaluation and application of materials, but in your entire assembly process. 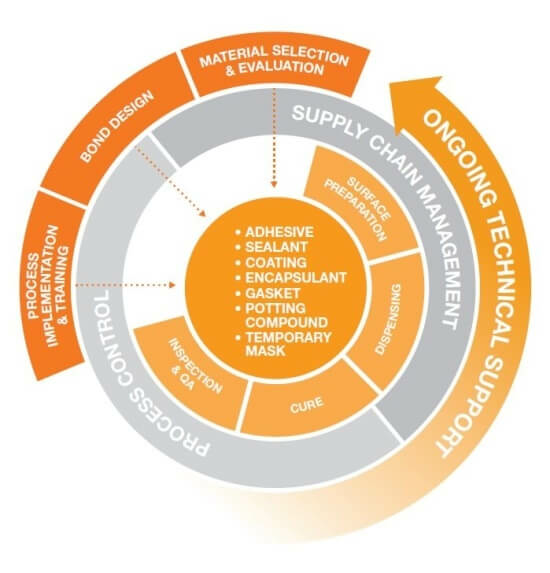 Your benefits extend from our initial understanding of your needs, working with you to establish your production process, implementation and ongoing technical support, to the timely supply of materials where and when you need them. 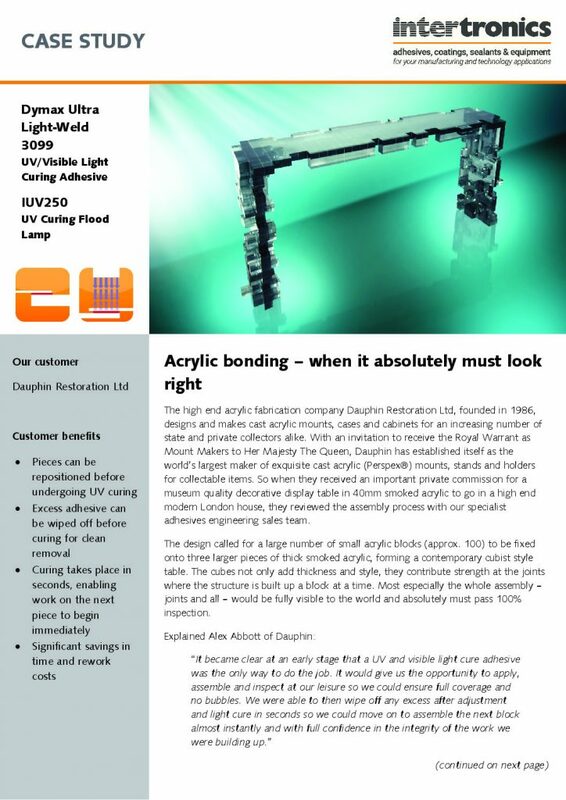 This has made us a partner whom our customers have depended on for nearly 40 years. 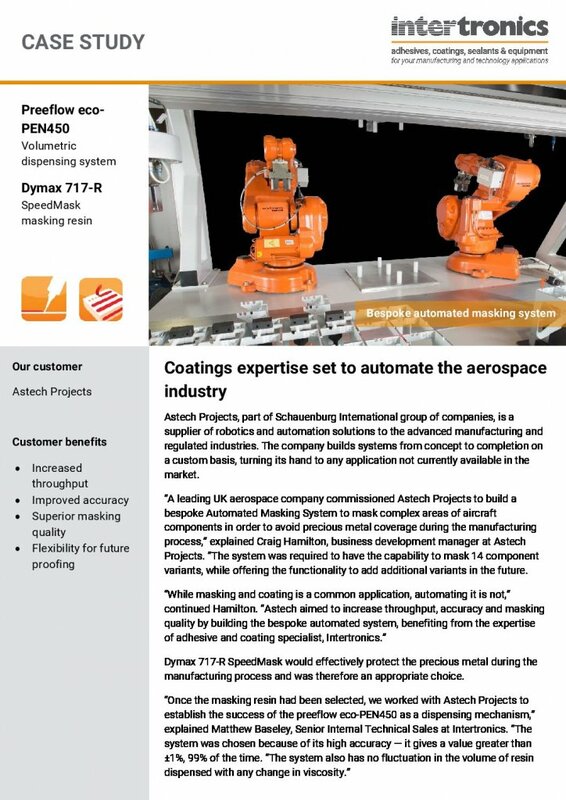 A leading UK aerospace company commissioned Astech Projects to build a bespoke Automated Masking System to mask complex areas of aircraft components in order to avoid precious metal coverage during the manufacturing process. 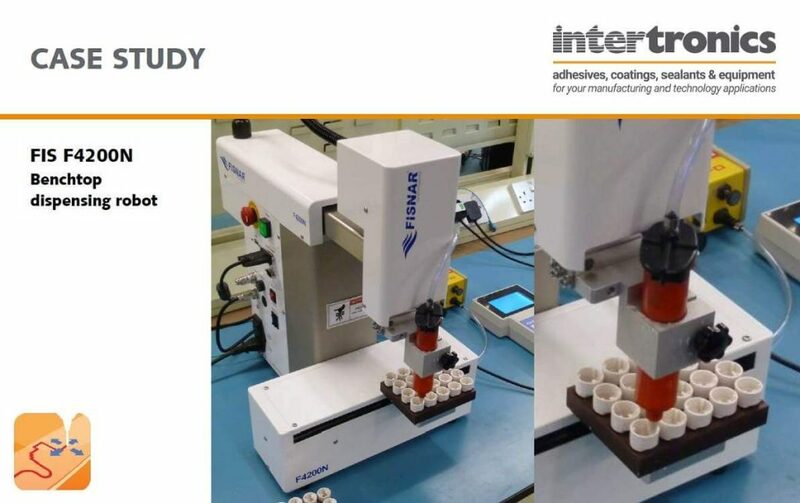 Astech worked with Intertronics to incorporate precision volumetric dispensing, Dymax SpeedMask resin, and high intensity UV curing lamps. 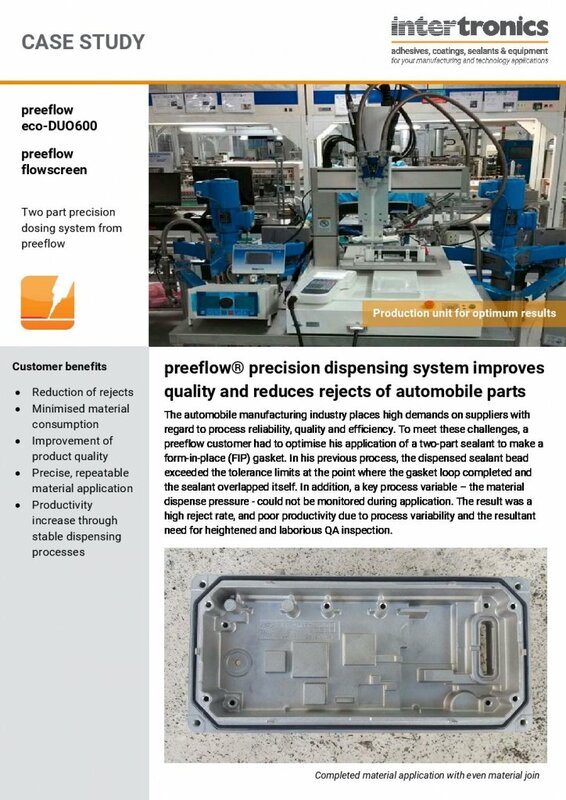 The automobile manufacturing industry places high demands on suppliers with regard to process reliability, quality and efficiency. 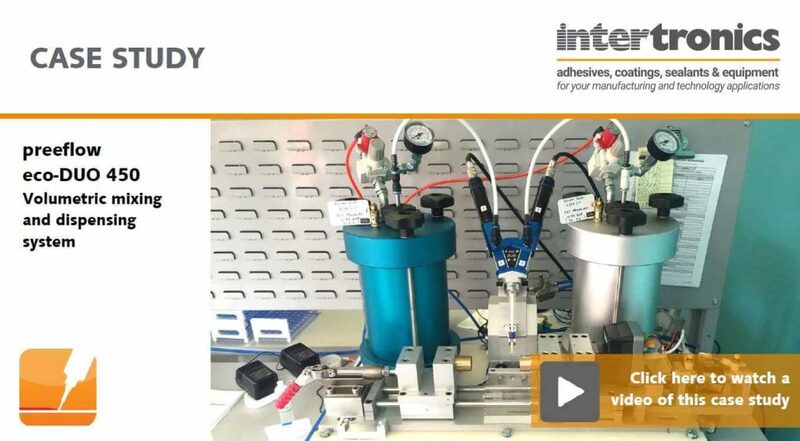 To meet these challenges, a preeflow customer had to optimise his application of a two-part sealant to make a form-in-place (FIP) gasket through precision dispensing. 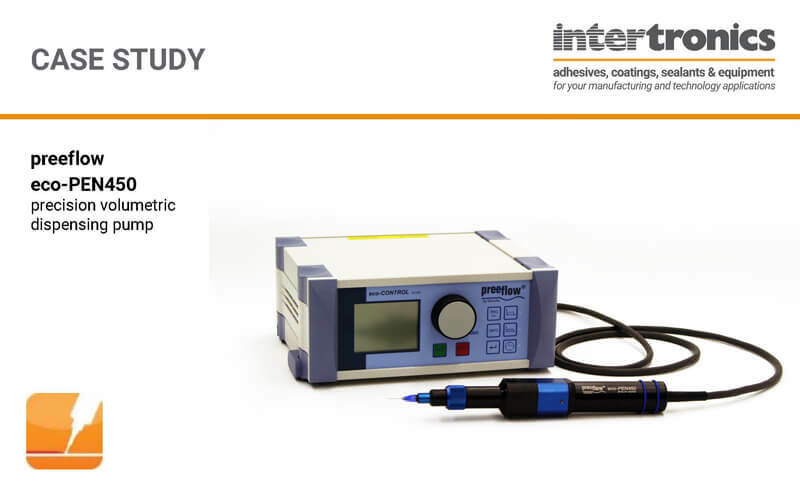 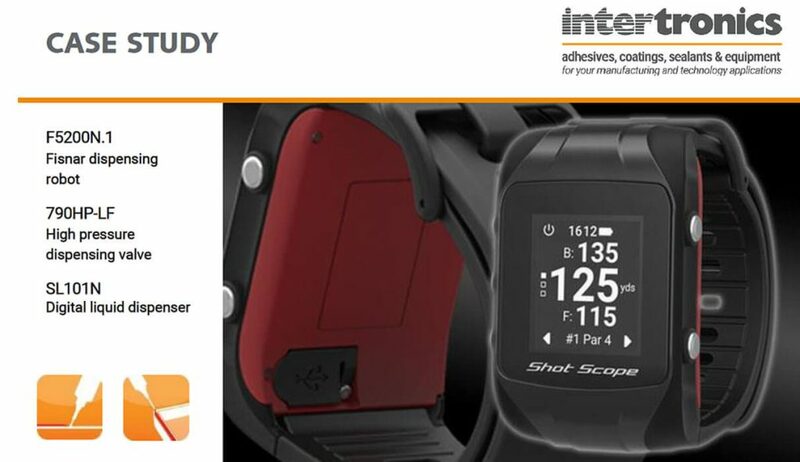 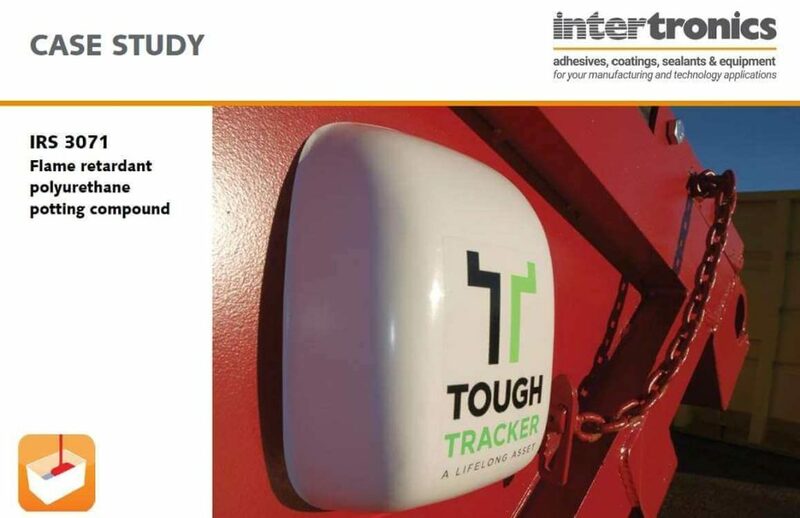 An automated sealant dispensing system provided consistent and reliable results in this wearable technology application. 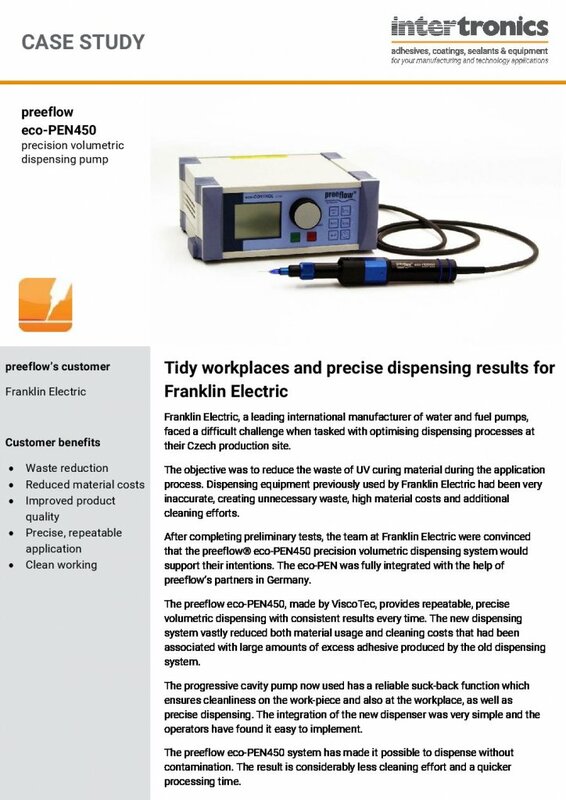 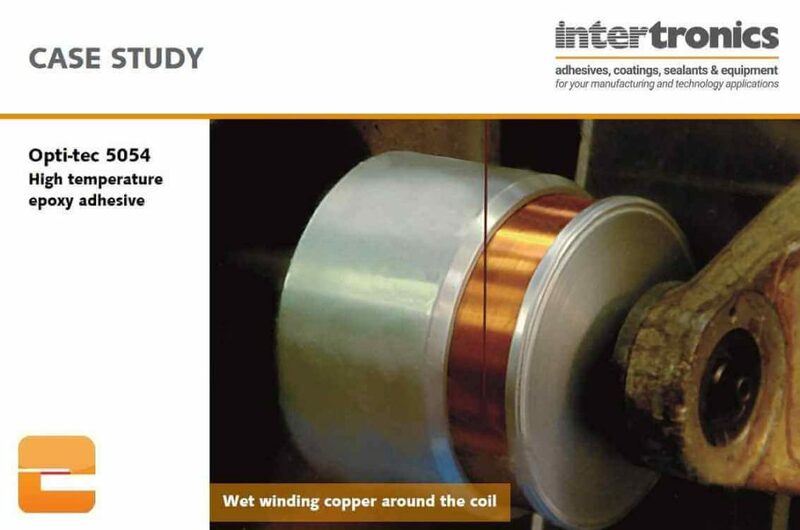 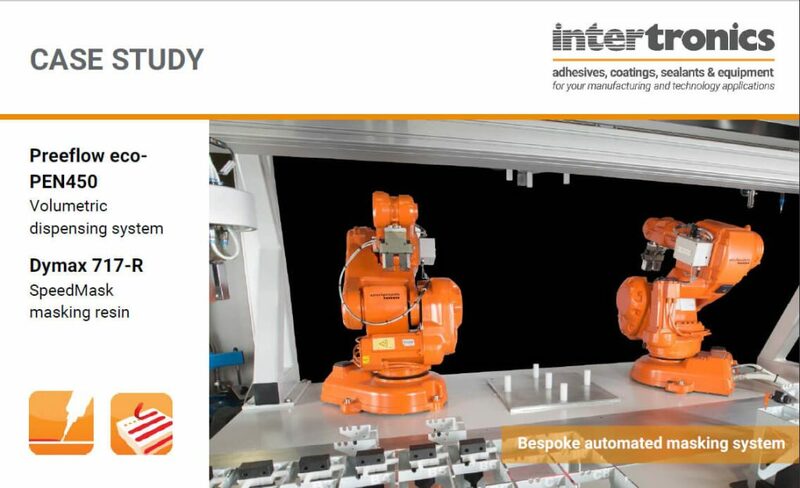 By switching to an automated dispensing system, this electrical manufacturer reduced scrappage and therefore improved quality and yield of their product. 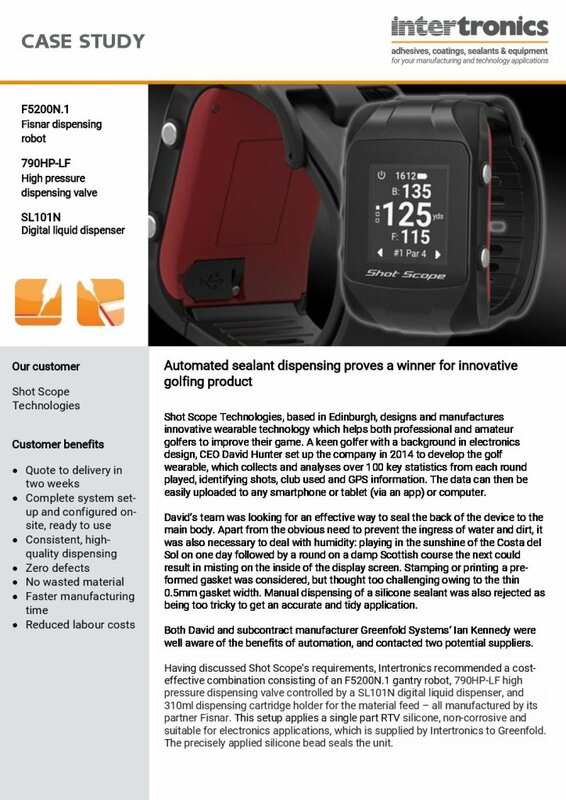 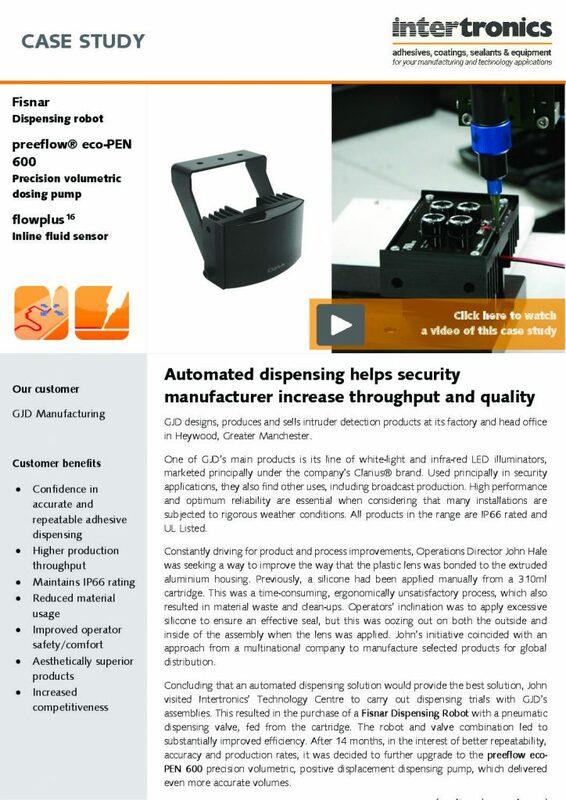 GJD Manufacturing switched to an automated method of dispensing silicone for sealing a plastic lens to aluminium housing. 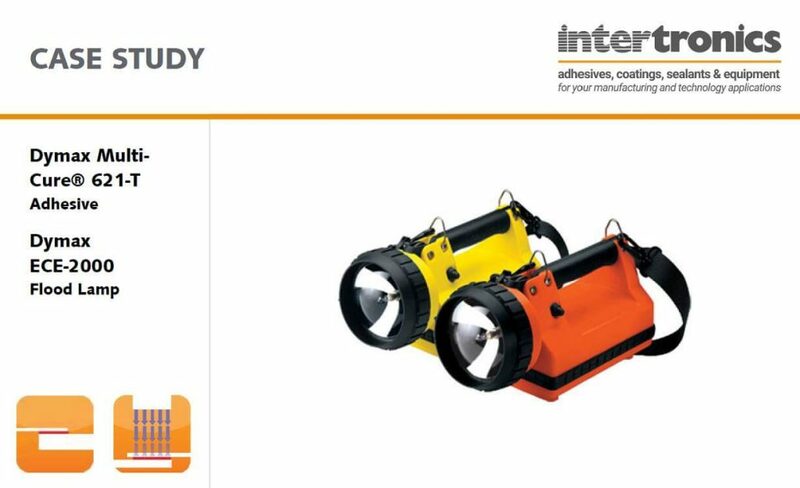 By doing this, they improved the throughput and quality of their white-light and infra-red LED illuminators for the security industry. 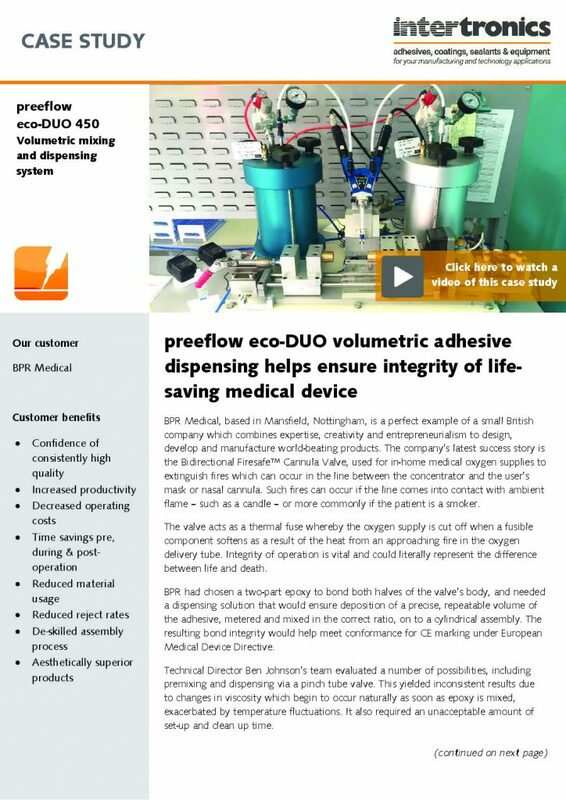 A medical application using volumetric dispensing equipment to ensure the high quality and efficient production of a life saving cannula valve. 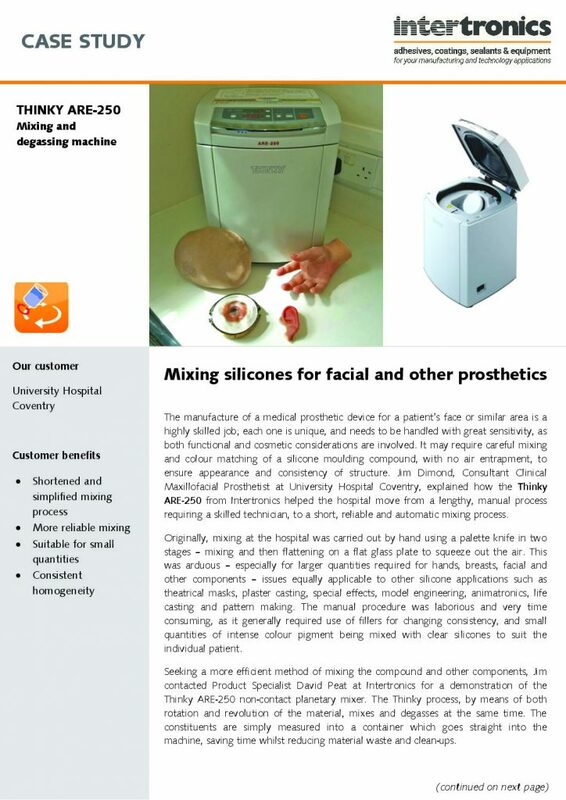 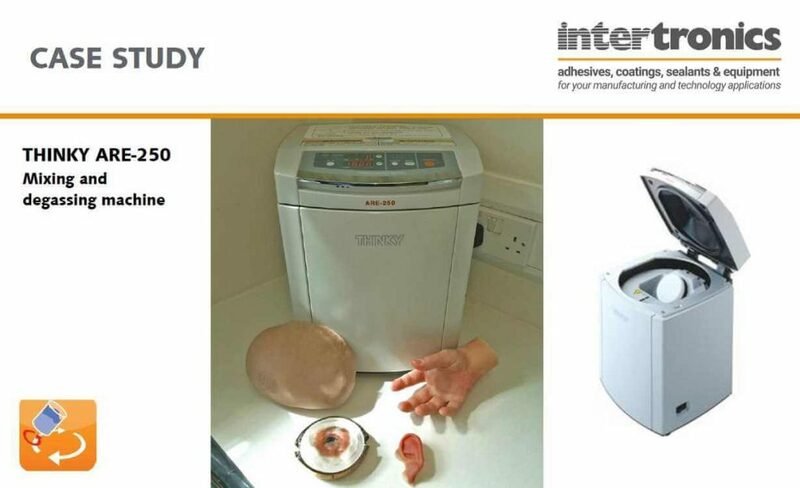 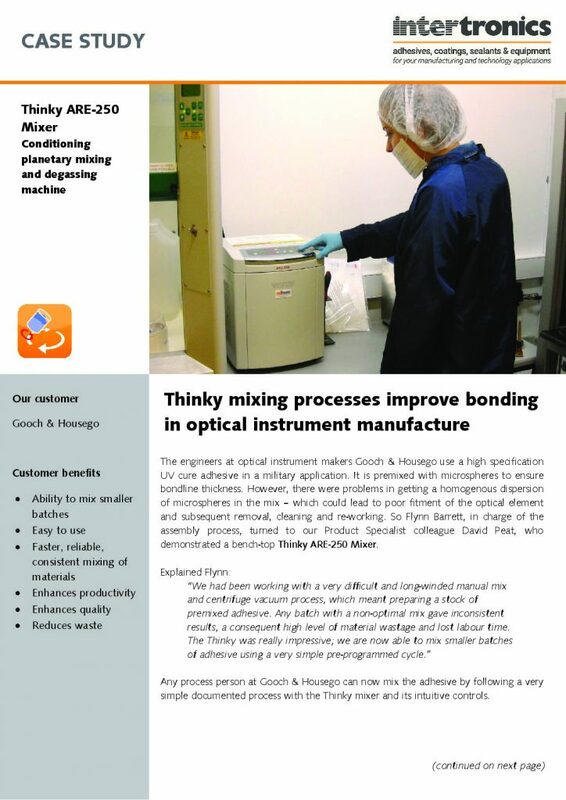 University Hospital Coventry chose a THINKY mixer to save time and improve the quality of their silicone mixing process to produce prosthetics. 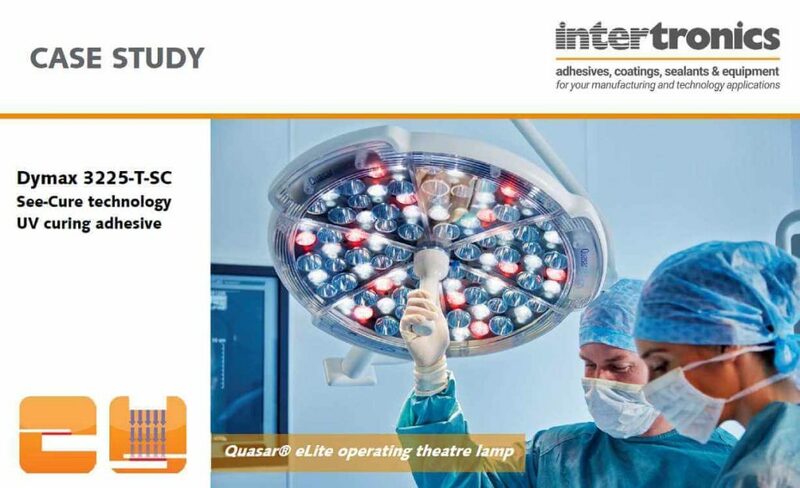 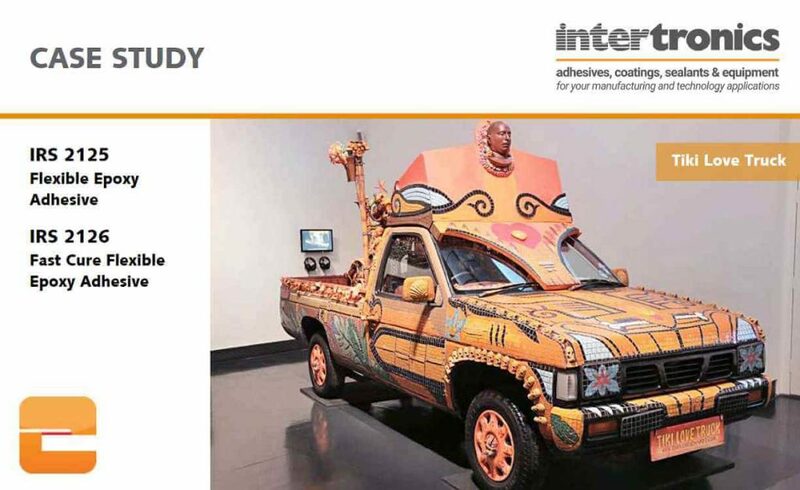 UV adhesive and curing technology produced a strong bond between dissimilar substrates on a product that needed to withstand rough conditions. 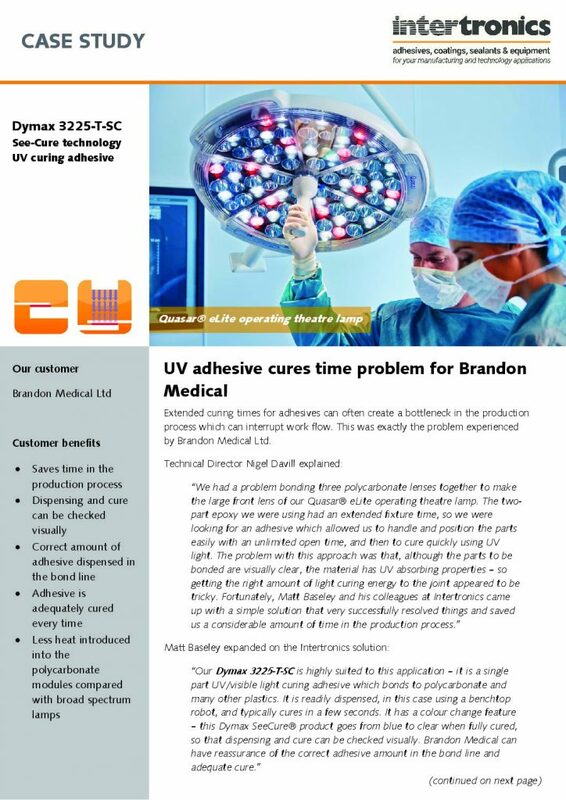 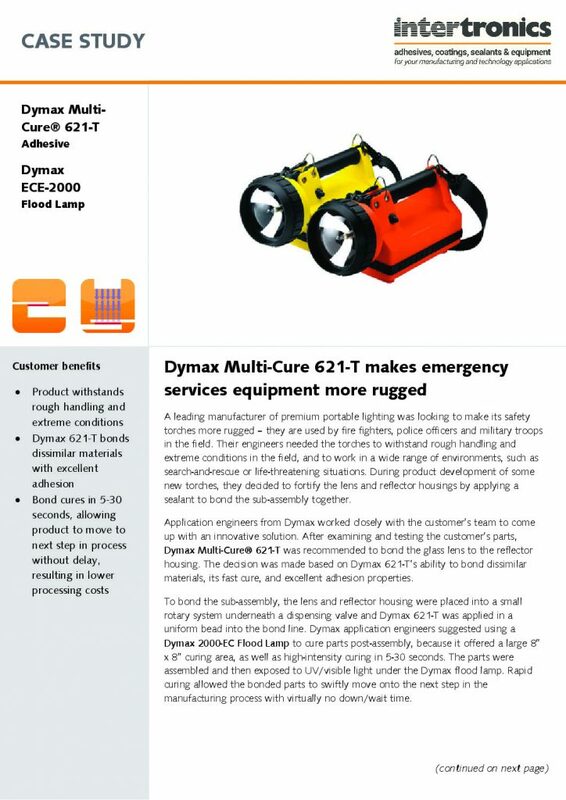 Timing of production processes were reduced and the opportunity for better quality control measures were aided by Dymax See-Cure technology. 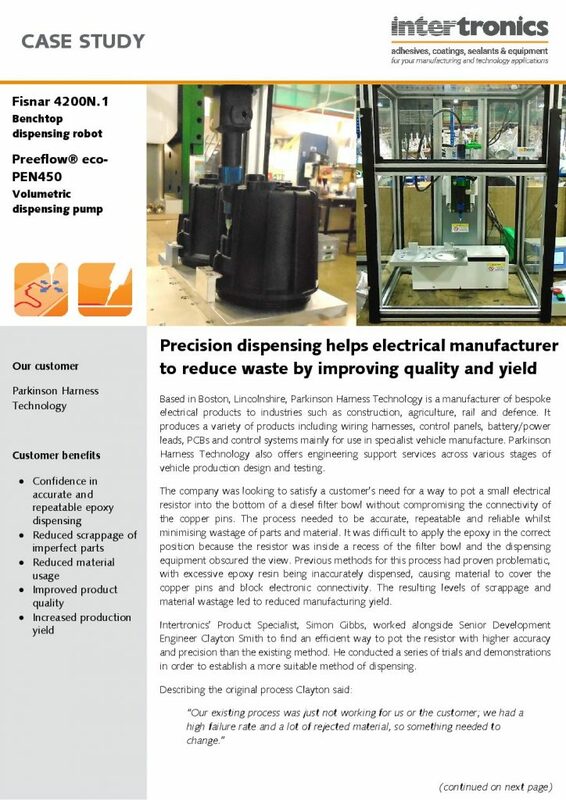 Plessey Semiconductors transitioned to a full production phase of their LEDs by using automated mixing and dispensing equipment. 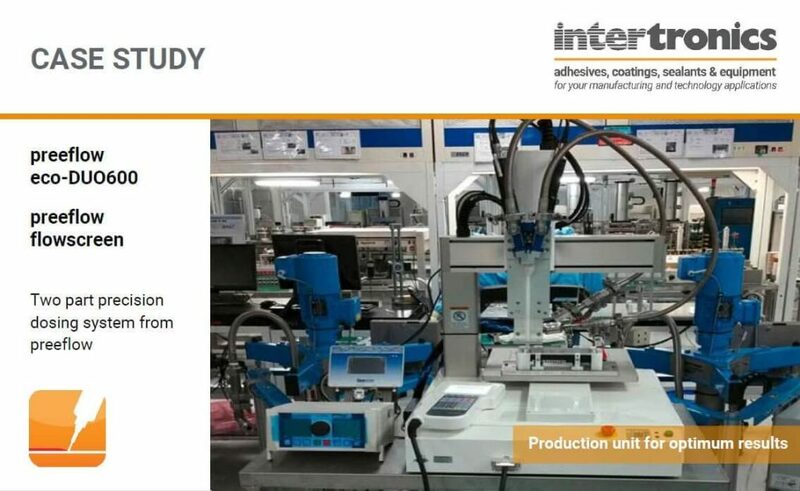 A planetary mixing and degassing machine allows a high specification adhesive to be mixed homogeneously, improving simplicity and quality of production. 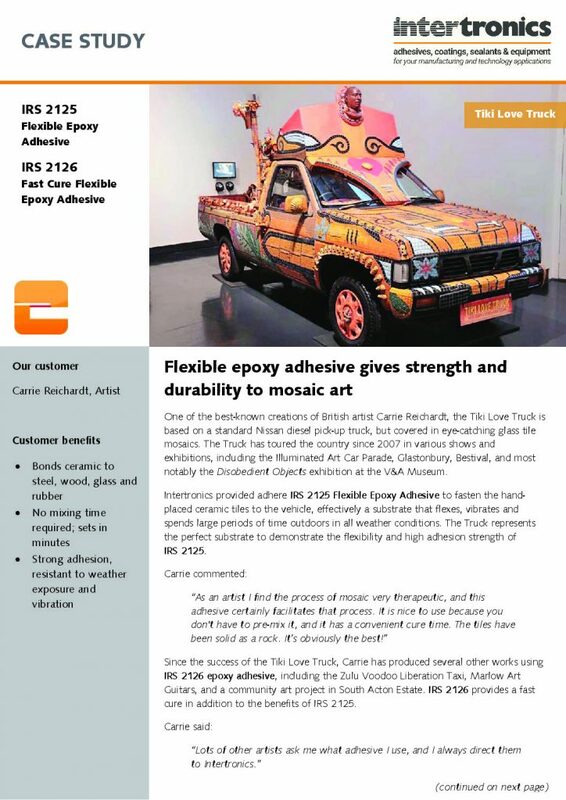 British artist Carrie Reichardt relies on our structural adhesives to create a strong bond in her creative pieces. 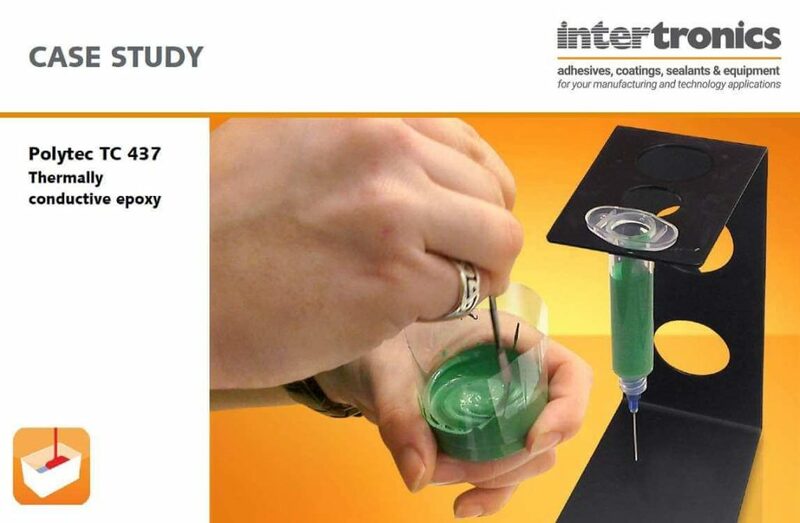 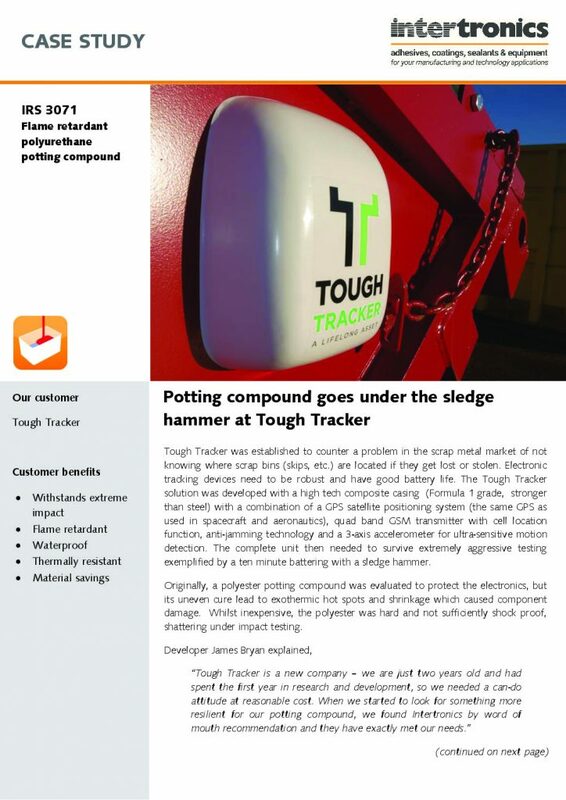 A flame retardant polyurethane potting compound enabled the protection of electronics and a resistance to high impact shock and extreme conditions. 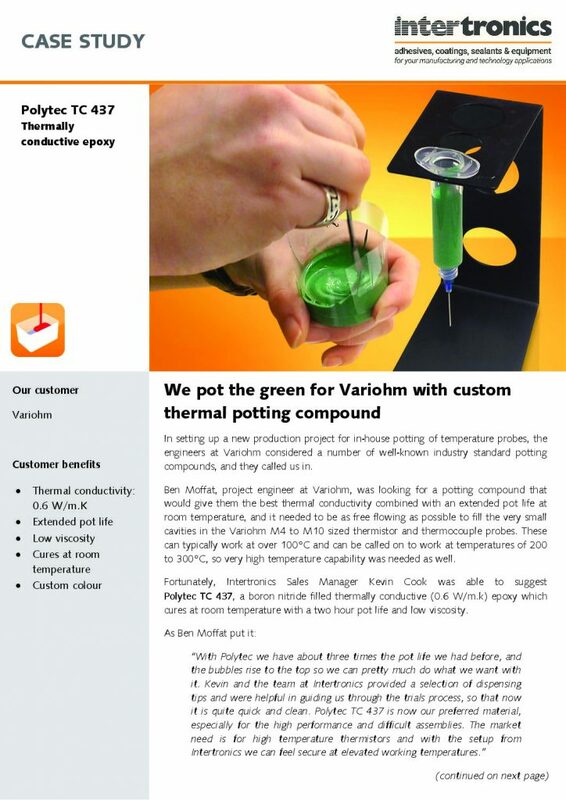 Potting compound requiring good thermal conductivity and an extended pot life in a custom made colour. 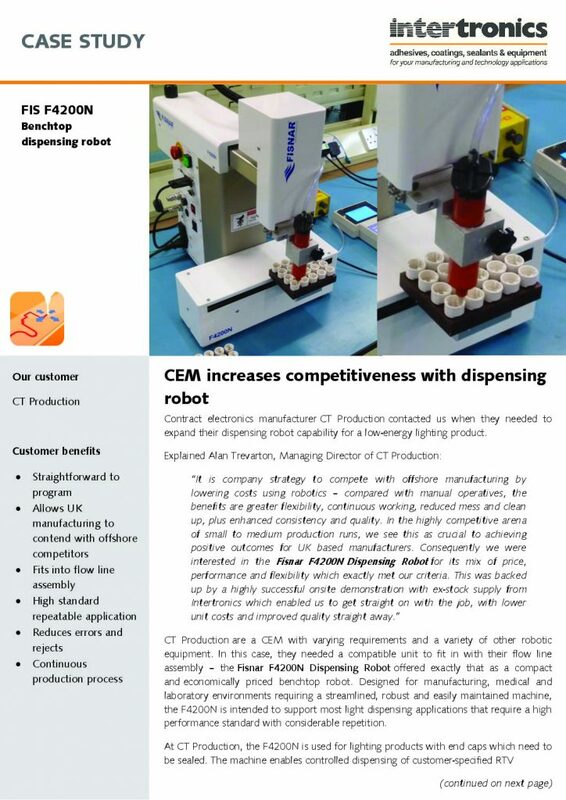 Integrating a benchtop dispensing robot into flow line assembly for electronics allowed for a continuous production process. 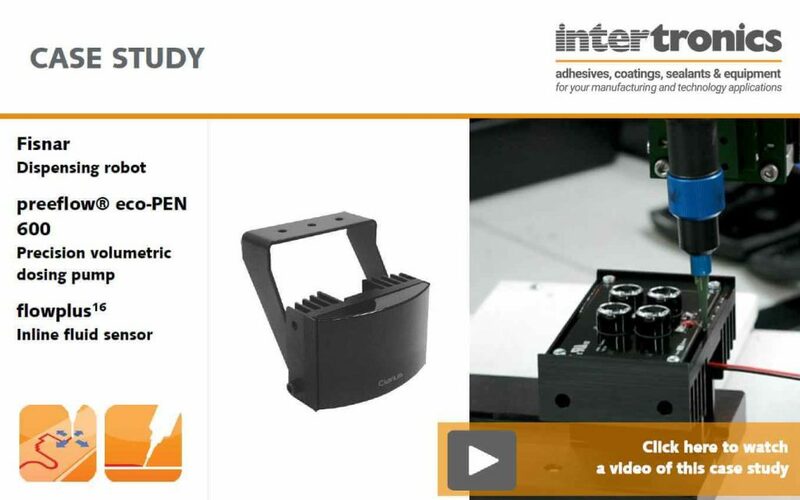 This resulted in reduced wastage, increased quality and increased output. 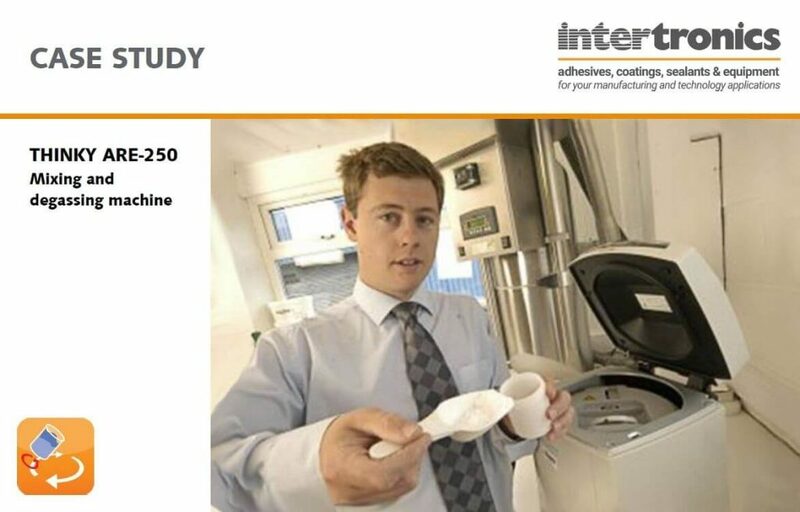 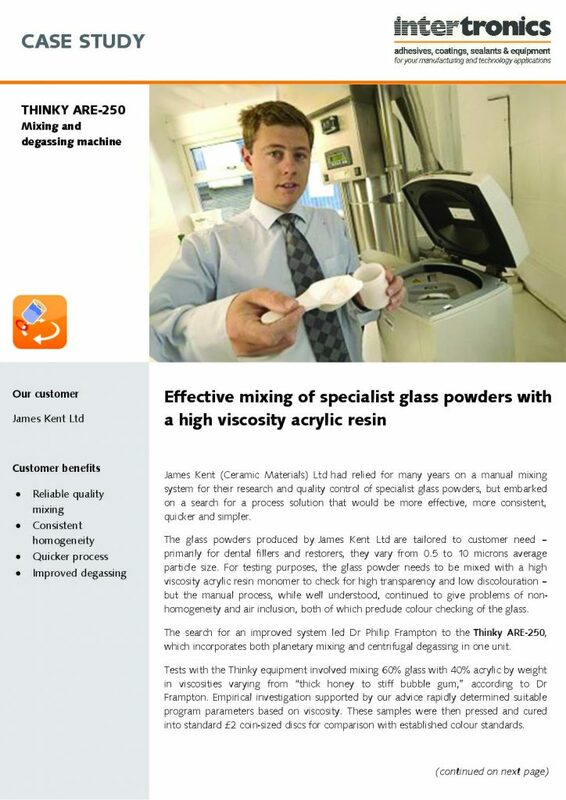 Consistent high quality mixing and improved degassing of powders into resins advanced the process capabilities of a ceramic materials company. 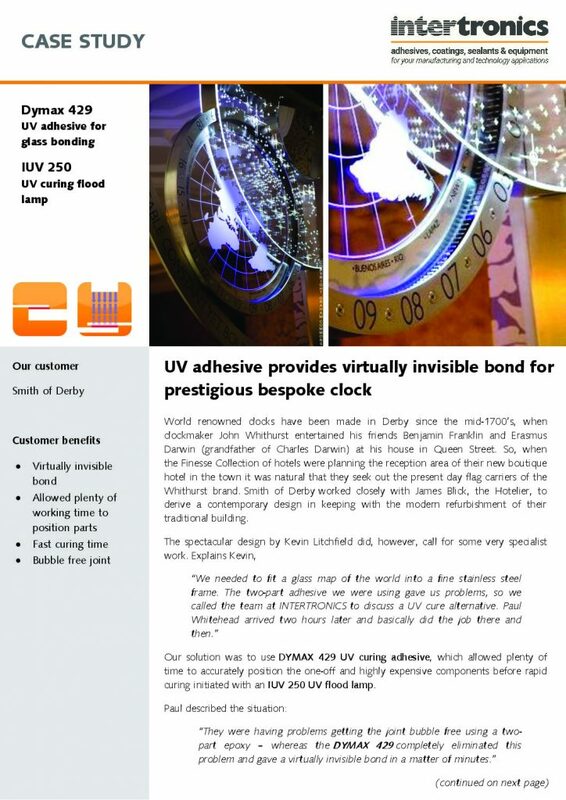 A UV adhesive and curing acrylic bonding application that required a quick, clear and clean finish to the bondline. 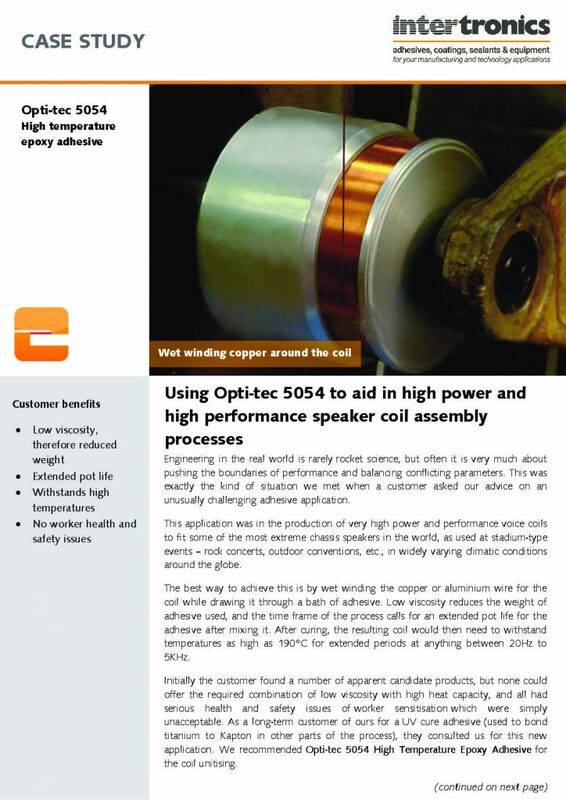 Speaker coil assembly required a low viscosity adhesive with resistance to high temperatures and extended pot life. 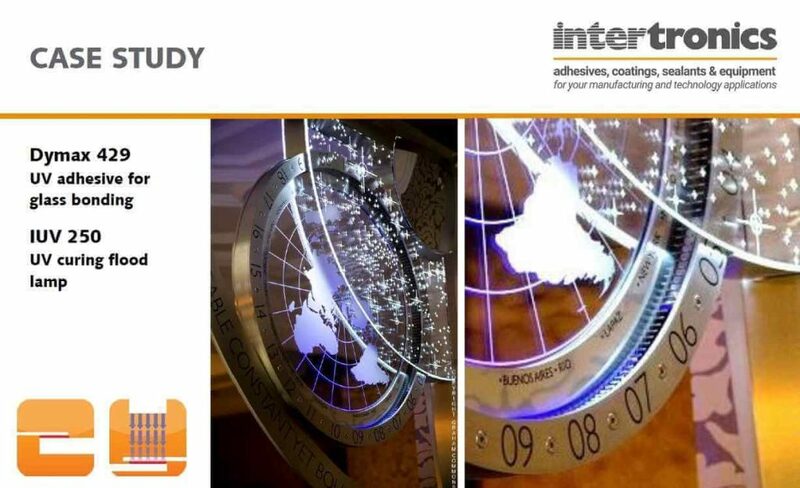 A custom design clock benefits from the use of UV adhesive and curing equipment for a transparent bond line finish.